A tall, creamy, rich NY-Style Cinnamon Sopapilla Cheesecake topped with crispy, buttery, cinnamon sugar tortillas. 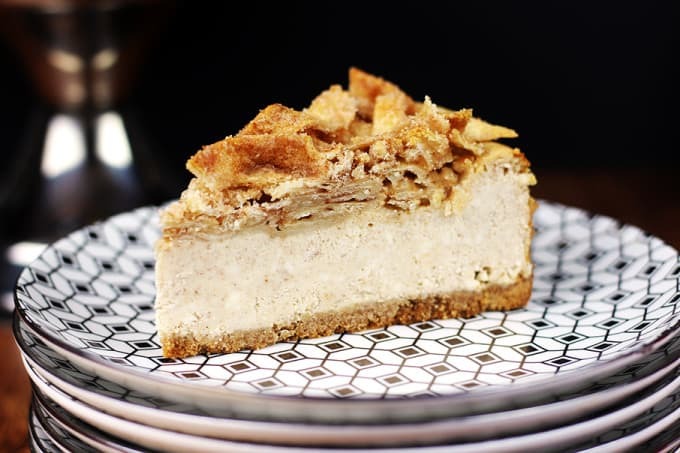 This Cheesecake has it all, a rich taste with a hint of cinnamon spice topped with a crispy sweet crunch, it is a showstopper of a dessert! This week has been full of delicious Chipotle food including the Barbacoa Beef Burritos and yesterday’s Lime Chips and Guacamole, so it seemed only fitting to top it all off with some Sopapilla Cheesecake. I’ve been using this base for my cheesecake recipes for since I was in high school and it has never failed me. It is an amazing cheesecake and I have made it for clients and family and friends in so many different flavors I have lost count. 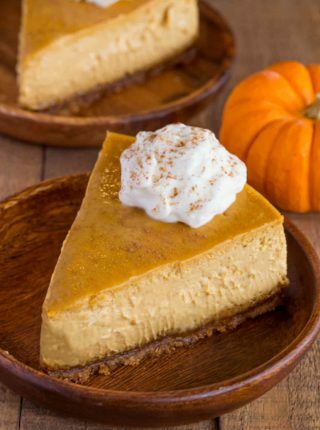 The idea of this recipe came from a pin I saw a while ago for some crescent dough as the base and top of a small cheesecake that is cut into squares and topped with cinnamon and sugar. My version is a bit more over the top. 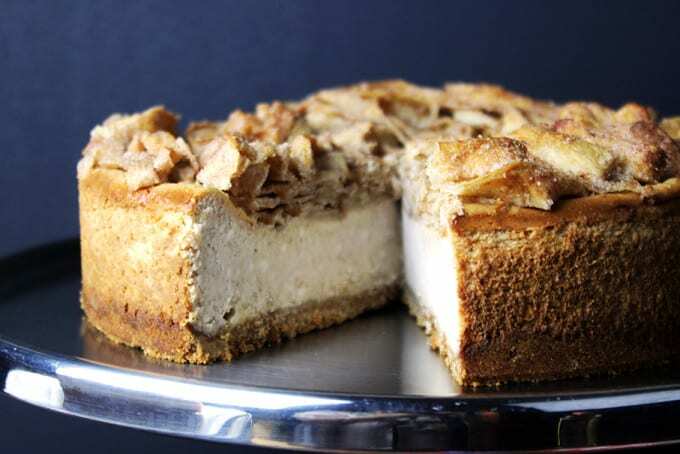 The cinnamon flavor carries through the cheesecake itself along with the crust! The tortillas are cut into strips and the butter makes them taste like the best pie crust you’ve ever had. It truly transforms the tortilla. This is not a new idea, not even to this blog! My Sopapilla Cinnamon Sugar Hearts are a treat I like to make with the kids every so often. So what are you waiting for?! Go make this cheesecake! Preheat oven to 350 degrees. Spray a 9 inch springform pan with baking spray. Mix graham cracker crumbs, 1/4 teaspoon cinnamon and melted butter. Push into an even layer onto bottom of springform pan. In your stand mixer, add the cream cheese and sugar. Beat until smooth. Add in the milk, and the eggs one at a time. Add in the sour cream, vanilla, 2 teaspoons of cinnamon and flour until smooth. Let’s talk springform pans for a second. That link above in the paragraph before is for a perfectly acceptable springform pan. It will totally work, and is super inexpensive (under $5!) but if you want something a bit more heavy duty, something that will hold up in the long run and make you lots and lots of cheesecakes, I recommend the one I use which is a Nordicware one or even a pretty Silicone Springform with Glass Plate and they are both around $16 so none of them will hurt your wallet too much. That being said I use my springform pan for a lot of different recipes from quiches to mousse cakes or anything too delicate to remove from a normal cake pan, so if you plan to use it for a bunch of different recipes too, I suggest one of the two I recommended in this paragraph. Add to the springform pan. Wrap the bottom of the pan with some foil and put into a water bath. To make a water bath find a pan with 2″ walls or higher and add 1″ of water. Add the cheesecake pan that has the outside wrapped with foil to that pan. Bake for 45 minutes. Toss your tortilla strips with the melted butter. 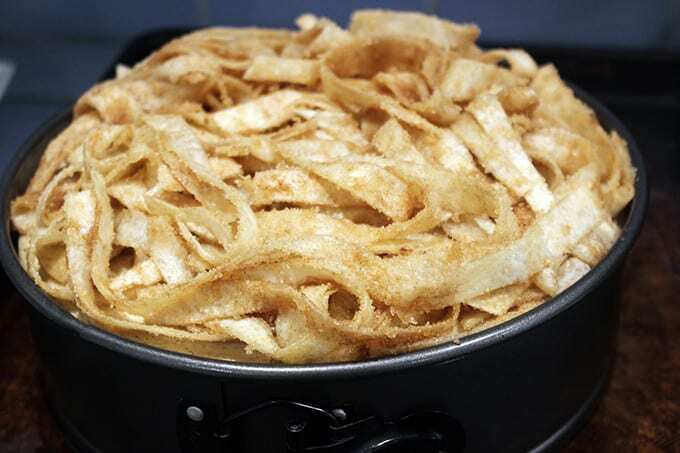 Add the 2 teaspoons of cinnamon to the sugar and toss with the tortilla strips. Open the door to the oven and quickly top your cheesecake with the sugary tortillas. Bake for an additional 15 minutes. Let it sit in the oven for another hour or so with the door cracked open. Best if you refrigerate for 6 hours or more, but delicious any way you want to eat it! 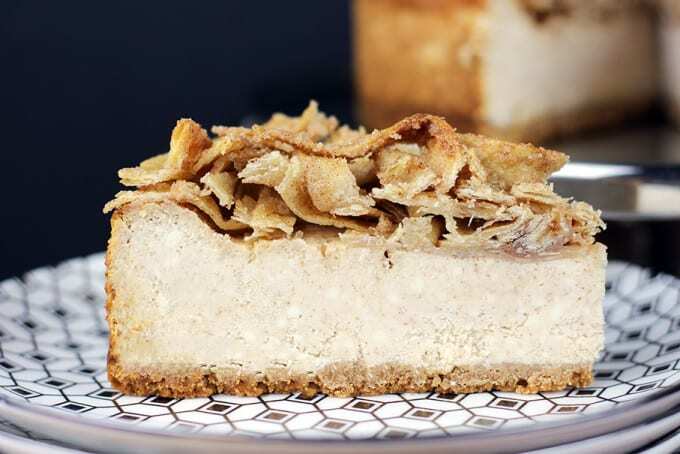 A tall, creamy, rich NY-Style Cinnamon Cheesecake topped with crispy, buttery, cinnamon sugar tortillas. 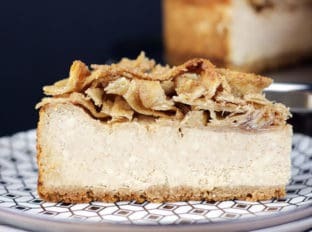 This Cheesecake has it all, a rich taste with a hint of cinnamon spice topped with a crispy sweet crunch, it is a showstopper of a dessert! Mix graham cracker crumbs, 1/4 teaspoon cinnamon and melted butter. Push into an even layer in the bottom of the springform pan. In your stand mixer, add the cream cheese and sugar. Beat until smooth. Add in the milk, and the eggs one at a time. Add in the sour cream, vanilla, 2 teaspoons of cinnamon and flour and beat until smooth. Add the mixture to the springform pan. Wrap the bottom of the pan with some foil and put into a water bath. To make a water bath find a pan with 2" walls or higher and add 1" of hot water. Add the cheesecake pan that has the outside wrapped with foil to that pan. Toss your tortilla strips with the melted butter. 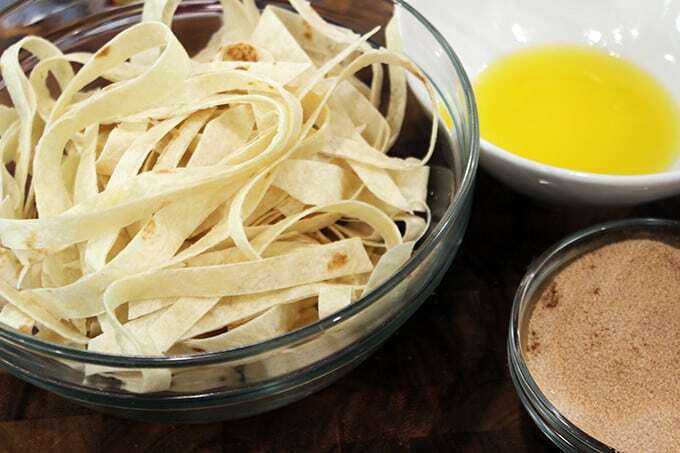 Add the 2 teaspoons of cinnamon to the sugar and toss with the tortilla strips. Open the door to the oven and quickly top your cheesecake with the sugary tortillas. Let it sit in the oven for another hour or so with the door cracked open. Best if you refrigerate for 6 hours or more, but delicious any way you want to eat it! Oh no, just seeing this now. You’ll want to shut off the oven and let it just sit in the oven for an hour. I hope you enjoyed it. This recipe was my first time making cheesecake from scratch. Absolutely delicious. Thanks for another winning recipe. Made this today. While the cheesecake itself is delicious the tortilla topping left a lot to be desired. I followed directions exactly and the tortillas were soggy and chewy. It was really disappointing. I will make the cheesecake again but will male some minor tweaks to the topping to make them more crunchy. My family was not happy with this lol. I’m making this for Thanksgiving. In the recipe it says put the graham cracker crust in the bottom of the pan but in the picture, it’s on the sides. Do you do the sides as well? The crust goes just at the bottom. The color you’re seeing in the photo is from the pan and not crust. Happy Thanksgiving! Trying this recipe tomorrow; the last 45 min of bake time, when oven door is open, do I leave the oven on or turn it off? The oven will be off when sitting in the oven with the door open. The reason you want to do this step is that the cheesecake needs to gently cool otherwise it’ll crack. Hope this helps! Awesome! This was my question as well!! Made this for a Cinco de Mayo/Birthday/Lake weekend and it was a hit! Made it the day before we left, it traveled well in the spring form pan in a cooler (important when driving from NC to GA) and the tortillas strips stayed perfectly crispy even after a few days of storage in the fridge, which was a concern of mine. Making it again this weekend for a cookout. Thanks so much! It’s delicious! I’m so glad you enjoyed it! I would love to see your creation if you’re willing to share it on Dinner, then Dessert’s Facebook page! Yup! And with all that butter the tortillas somehow transform and taste almost like pie crust! I would love to BURY MY FACE in this! this looks DELISH. 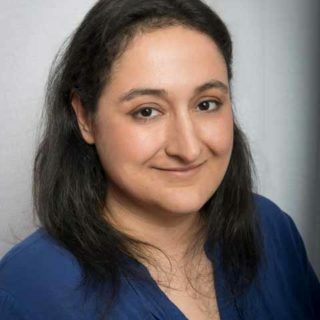 I’m new to your blog, but it’s fantastic! You have great pictures and I love your blog name 🙂 Really catchy. Welcome! I am so glad you found me 🙂 Thanks for the compliments! Will you make this for me ? I’m drooling on my keyboard over this ! this looks amazing! 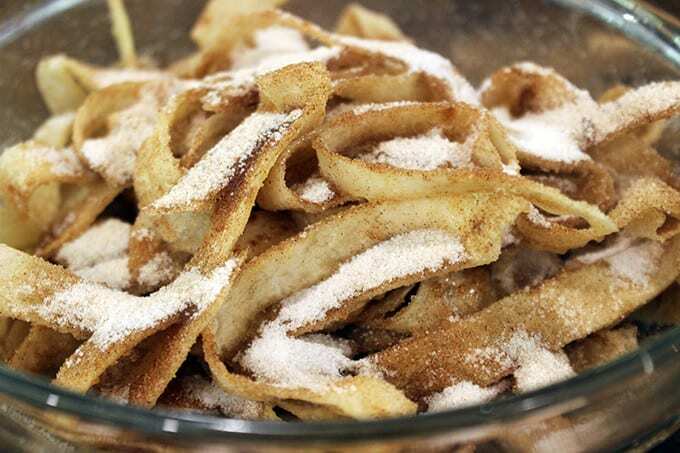 what a unique idea to use tortilla strips laced with cinnamon and sugar on top! I’m more of a fruit girl for my cheesecakes but I think my husband and sons would like yours better! When you try a piece of it you’ll be a convert too. I love fruit toppings too but this tastes like pie crust because of the butter. I was hooked and had to leave the room to stop picking at it. Oh wow! That not only looks delicious it sounds delicious, too! Thanks for the recipe! Oh sweet Jesus…please tell me you deliver. This looks plum amazing. Almost too pretty to eat! Almost…LOL..because I bet it tastes as great as it looks! 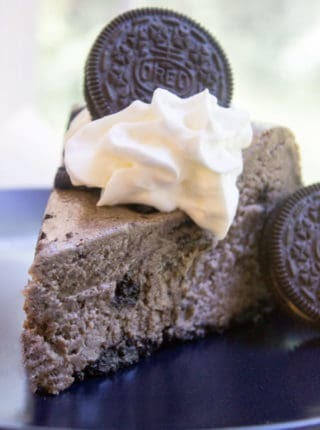 This cheesecake sounds AHmazing! I think I need a bowl of topping on the side too! Yeah the topping is addicting. I suggest not tasting before serving or you’ll be standing over it trying to pick off inconspicuous pieces. My kids would love it if i made this. 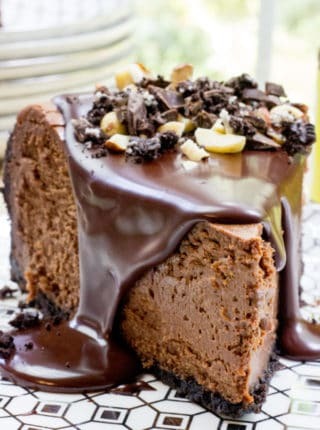 I will have to get th ingredients so i can make this for dessert on Saturday. I have never tried to make my own cheesecake before. This looks so delicious and easy to make. I will have to give it a try. YES! Please do try it you would be surprised at how easy it is! Cheesecake is my absolute favorite. This looks like a delicious recipe. I will have to try it this weekend. Awesome, I hope you love it Ann! I love cheesecake, it’s one of my most favorite foods ever. I totally wish I had a piece of this cheesecake right now! Thanks! I wish I did now too. I love Sopapillas so much! 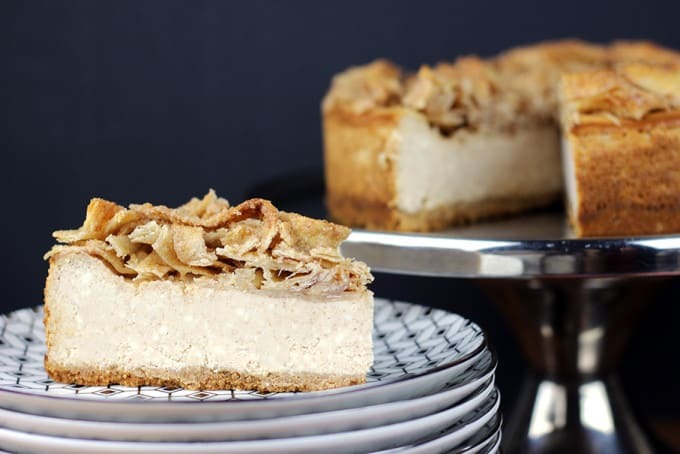 I live the idea of crispy sugary treats on top of that creamy cheesecake! I am going to go back and try your Chipotle Lime Chips with Guacamole too! Yum!! I was totally in a Mexican food mood! Haha. I hope you love them! Oh my goodness, cheesecake is one of my very favorite kinds of desserts! I need to try this sopapilla cheesecake! My mouth is watering right now. Thanks! I feel like I did my job haha. Such a unique topping! I’ll bet it’s amazing on cheesecake 🙂 I’ve actually got some tortillas on hand… might have to get crafty this afternoon and see how they turn out! What a great idea! You are so creative! I love sopapilla and the cheesecake would make it even more scrumptious! Cheesecake is one of my all-time favorite desserts. This looks amazing. Whoa! This cheesecake sounds too good to be true. 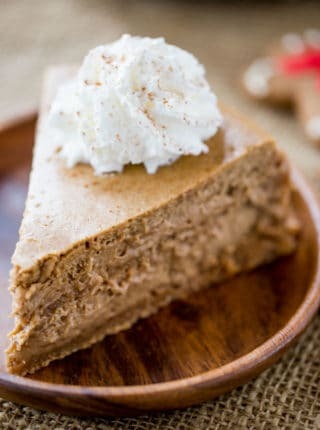 I love the idea of using cinnamon in a cheesecake. I’m am pinning this right now. Thanks so much for the pin! I hope you love it! This looks amazing! I bet this would surely impress a bunch of guests! Great recipe!